How to Read Your Electric Meter Your electric meter keeps track of your electricity consumption for you. Electric meters record the total amount of electricity used. 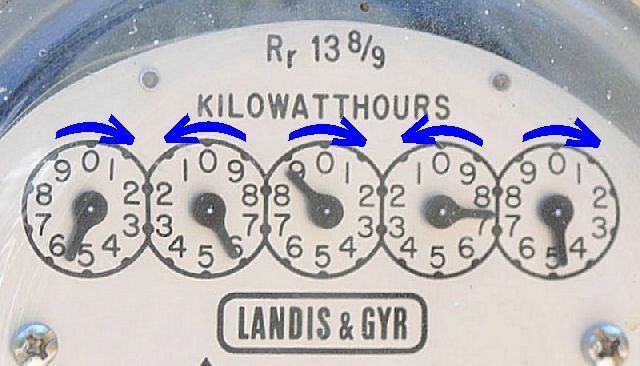 You can look at your own usage by learning to read your own meter. Take a look at the illustration. Note the direction of the hands on each dial as indicated by the blue arrows. The directions alternate from clockwise on the first dial, then counter-clockwise on the second dial, then clockwise again on the third, and so on until the last dial. Read all the dials from right to left, and write the numbers down from right to left. When the hand on any dial is between two numbers, read the smaller number. Exception: If between 9 and 0. read it as 9. If the pointer appears to be exactly on a number, record the next lowest number unless the pointer on the dial to its right has passed zero. DIAL # 1: The pointer is between 4 and 5. Record as 4. DIAL # 2: The pointer is between 7 and 8. Record as 7. DIAL # 3: The next dial is almost at 9, but not quite there yet. It's between 8 and 9. Again, record the smaller number which is 8. DIAL # 4: The pointer looks like it is right on the 6 but, the dial to its right has not passed zero. So, you would record this dial as 5. DIAL # 5: The pointer is between 5 and 6. Record the smaller number which the pointer just passed, which is 5. Therefore, the reading on the illustration is 55874. Read the numbers from RIGHT to LEFT, and write the numbers down in the same order (from right to left). Record each reading along with the date of the reading. When you record another reading on a future date (SFELAPCO meter readers usually read your meter on the same day of each month, give or take a few days, depending on various circumstances, e.g., flooding). Subtract the previously recorded reading from the present reading. The difference, in KWH, is your raw consumption for the period covered. If your connection has a multiplier, multiply it to the difference you computed and that would be your final consumption.